With a desire for less reliance on coal and no more nuclear power, Germany wants to switch its energy supply by 2050 to renewables, particularly wind, solar and hydroelectricity. 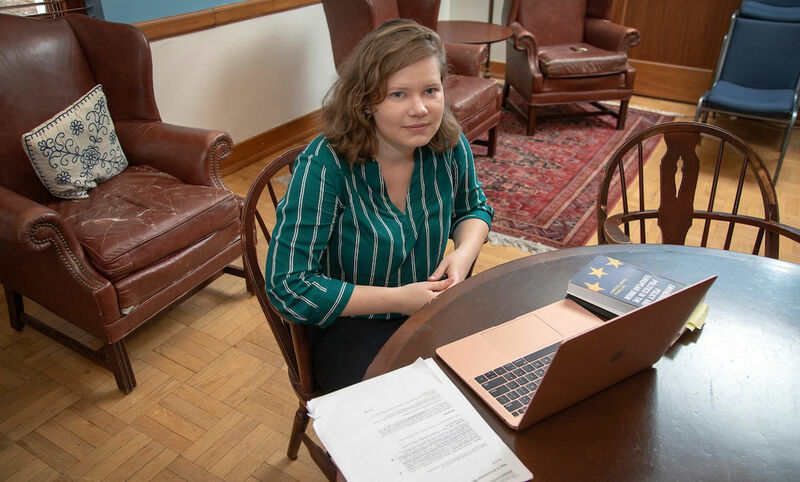 Franklin & Marshall College senior Teresa Norman is researching this transition, what the Germans call “Energiewende,” as an independent study that requires her to use her German-language skills as well as her analytical abilities. “I’m a double major in German and environmental studies, and so I have an interest down the line in merging those two majors in my career field,” said Norman, who wants to work in the environmental field in Germany. The research project she will present at F&M’s Research Fair this year analyzes the feasibility of the Germans’ energy transition program. Assistant Professor of Environmental Studies Elizabeth De Santo guided Norman in her work, particularly on European Union policy issues. The Baltimore native doubts whether the Germans can meet the carbon-emission goals before the deadlines they set for themselves. Germany gives subsidies for solar panels, for example, but the individual home that generates enough electricity to feed the grid gets paid for that contribution, Norman said. Norman also is analyzing the political factors for achieving success. The right-wing Alternative fur Deutschland Party, which has gained significant power in recent years, is more supportive of coal than alternative energies. The party poses a threat to Energiewende, Norman said.